A couple of weeks ago, I posted a recipe for grilled avocado with prawns which was delicious and everyone who has tried it - loved it! It was only a part of a Mexican style food feast I created in collaboration with Gran Luchito Smoked Chilli sauces - there was so much more I did with a handful of fresh ingredients, some delicious sauces and recipes for inspiration on the Gran Luchito website. and all of these use the Smoked Pasilla Oaxaca Chilli which is twice as smoky as the more commonly known chipotle chilli - but funnily enough only half as hot. I would say these sauces still pack a punch! So with our mutual love for Mexican food, we teamed up to review the sauces, try some new recipes and bring a little Mexican magic (and spice) into your kitchen! Peel and cut the parsnips lengthways into quarters. Take a roasting tray and pour in a couple of teaspoons of vegetable oil all over the tray. Throw in the cut parsnips, and glaze them with the Smoked Chilli Honey - this stuff is sticky, so I prefer to use a cooking brush to do my glazing. Once the parsnips are covered in delicious sticky honey, sprinkle on the parmesan and fresh thyme, add in some salt and pepper, cover the tray with tin foil and place in a preheated over at 200c. Grab the parsnips out of the over after 20 - 25 minutes and they will be ready for feasting on! Delicious earthy flavours with a sweet and spicy kick - mmm! I love the vegetables which are used in Mexican recipes - deliciously sweet peppers, crunchy lettuce, creamy avocados... By the way, if you haven't tried grilled avocados yet, I highly recommend it! They are delicious. 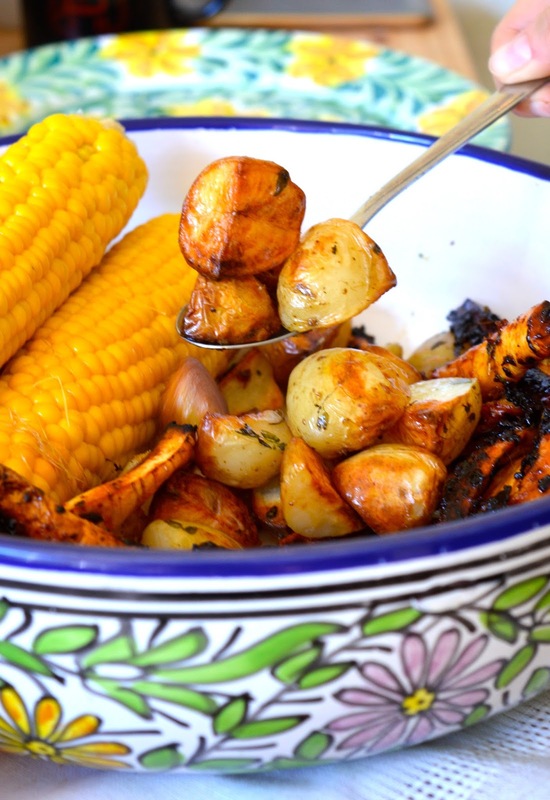 Grilled vegetables are perfect for making veggie fajitas, added to salads, and accompanying meals as sides - especially when they are covered in Gran Luchito Smoked Chilli Paste before being grilled! Grilled meat in fajitas is delicious - especially when it's been marinated in chilli sauce for tenderness and flavour. 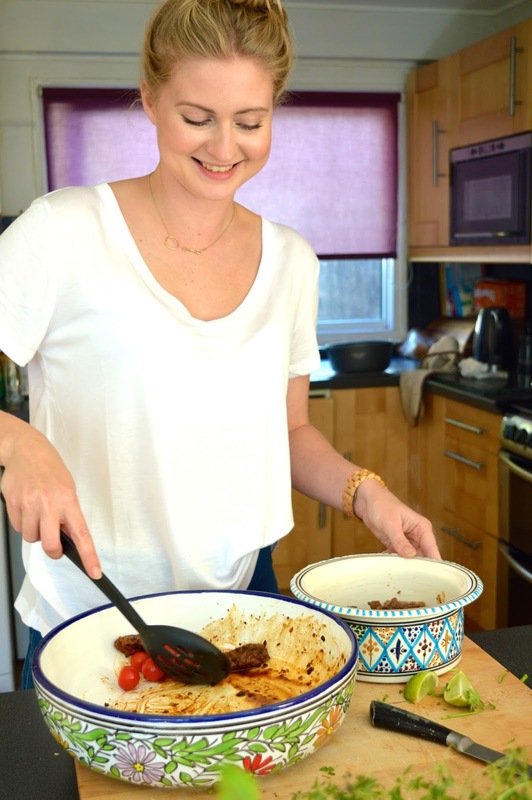 My favourites are beef and chicken fajitas which are great to use at dinner parties as you can cut thin strips from the meat, meaning you don't need to buy as much meat (saving money) yet still have deliciously tasty fajitas! For my fajita meat, I marinate thinly cut chicken and beef strips in Gran Luchito Smoked Chilli paste and a little splash of olive oil. Leave the meat for at least 1 hour, but the longer you leave it the more flavour it will keep. Heat up a griddle pan to the max - then place your beef strips on the hot pan for about 2 minutes on each side. I like beef to be rare, medium rare at most, so meat is juicy and tender. Then place the chicken strips on the griddle pan - cook for about 4 minutes on each side to ensure they are cooked through. Cooking on the same pan has two benefits - the chicken cooks in some of the beef juices, gathering more flavour; and you only have one pan to wash up! Plate up the meat and serve HOT with a little extra sprinkle of the chilli paste if you're feeling brave. 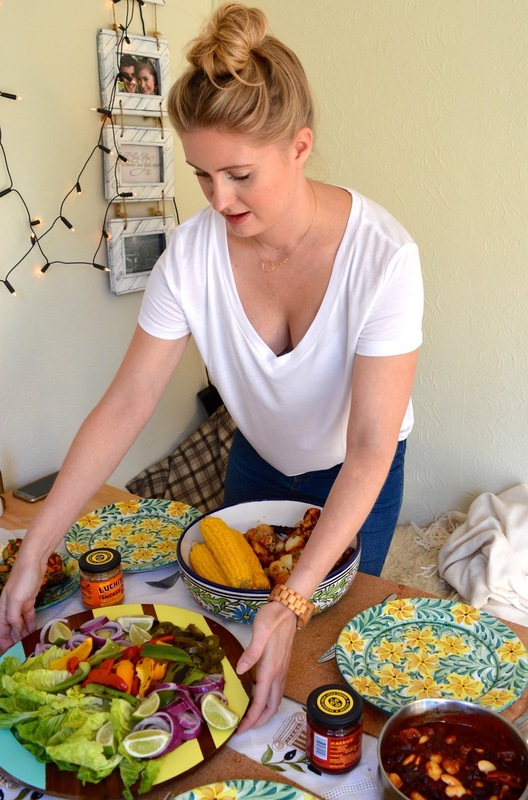 Mexican feasts are colourful, flavoursome and fun - I use big dishes to plate up salads, veggies, fajitas, and other necessities, and give my guests the freedom to pick and choose whatever they like, however they like, and as much as they like! Grilled avocados with prawns were definitely the biggest hit - you can find the recipe for it here (quick, easy and YUMMY!). But I would say everything went down really well - especially as we had Gran Luchito Smoked Chilli Ketchup and Mayonnaise as condiments, which were delicious! The mayo was so tasty - I really want to try it in a burger as I think it will be simply incredible for taste. 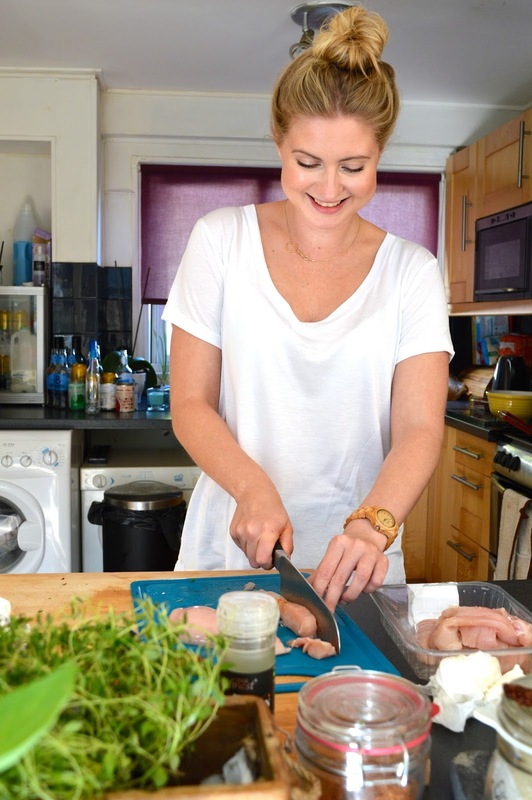 I love spending time cooking up feasts in the kitchen for my family and friends - the kitchen is definitely my favourite place in this house! Gran Luchito sauces made this feast a lot of fun, with added kick, and excitement to try something new. This feast was brilliant as Sunday lunch, but can also be cooked up for a Saturday night dinner with a couple of Desperados, or on a smaller scale for a fun date night. If you want to try the sauces, you can find them in Marks & Spencer, ASDA, Amazon, Ocado, Booths and Whole Foods Market.